When it was announced in 2008 that Harry Potter and the Deathly Hallows would be split into two movies, such an idea for a franchise’s climax seemed odd and alien. While many cynical moviegoers cried studio greed, it was seen by many as a strong creative decision, considering how much material was in J.K. Rowling’s ultimate book. In the wake of Harry’s two-parter ending, though, more and more movie series have decided to follow suit, from the Twilight saga’s Breaking Dawn to the recent announcements that the Divergent and Avengers trilogies would become 4-parters. Moves like these feel more studio-driven and motivated by dollars rather than fan satisfaction, and it the very thing that hurts Mockingjay, Part 1 the most. Mockingjay, Part 1 continues the series’ look at the effect of war on young people, with deeper emotions and stronger characters than had a chance to be examined in the futuristic arena concept of the first two movies. 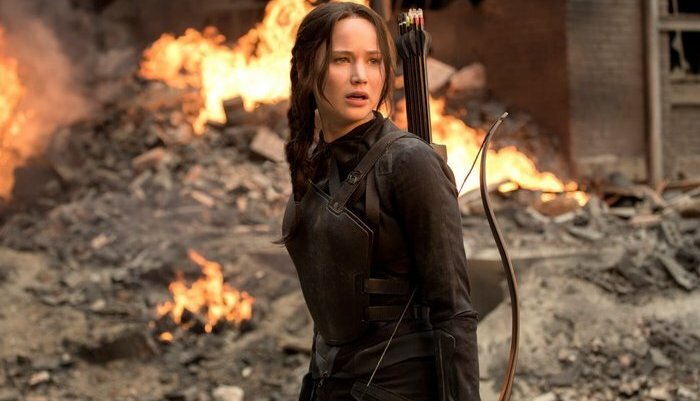 Katniss Everdeen (Jennifer Lawrence), whose rebellious decision in The Hunger Games sparked a rebellion that began taking hold in last year’s Catching Fire, is now grappling with the reality of her decisions. Picking up immediately after the shocking ending of Catching Fire, Mockingjay: Part 1 finds Katniss coping with life in District 13, long thought to have been destroyed ages ago. She’s reunited with Gale (Liam Hemsworth) but now separated from Peeta (Josh Hutcherson), who couldn’t be rescued from the Quarter Quell arena and is now the prisoner of President Snow (Donald Sutherland) in the Capitol. Full-blown insurgency has begun in most of the twelve districts, as Katniss has sparked a revolution against the greedy and manipulative Capitol. Deep within District 13, President Coin (series newcomer Julianne Moore) and Plutarch Heavensbee (Philip Seymour Hoffman, in wonderful form) work on completing Katniss’ growth into a propaganda symbol and the embodiment of the mockingjay symbol that has come to represent standing up to the Capitol cruelty. Katniss, in her wisdom, agrees to work with them only if they agree to rescue Peeta from the unimaginable tortures he’s suffering at Snow’s hand. Without a gladiatorial game at the center of the movie, Mockingjay, Part 1 has a starkly different narrative feel than the first two movies did, which might not appeal to some. It’s much more about building up armies and shooting propaganda films than about Katniss taking the initiative to fight her own fights, like in the past. Unlike Harry Potter and the Deathly Hallows, which was a 759-page tome with enough substance to support two films, the scant 390 pages of Mockingjay doesn’t have enough material to keep the momentum going for two films, leading to Part 1 spinning its wheels a fair amount and not having a natural climax. Director Francis Lawrence and screenwriters Danny Strong and Peter Craig try their best to make an entertaining movie out of less than 200 pages of source material and succeed more than they fail, but ultimately can’t overcome the lack of a through-line that comes from leaving all the most impressive scenes for the Mockingjay, Part 2. One thing the movie improves upon over the books, much like the last two movies did, is opening up the perspective of the characters. Suzanne Collins’ book trilogy was told from the first-person POV of Katniss, leaving many scenes that would have been quite thrilling to read as mere incidents Katniss simply hears about after the fact. By being freed to show events Katniss doesn’t directly participate in, Mockingjay, Part 1 feels bigger than the book did. Scenes like President Snow getting prepped before making a speech or an attack on a hydro dam work much better here than in the source material, where they were just intimated. With an Oscar-calibre cast and increasingly impressive visual effects, Mockingjay, Part 1 has a lot about it that’s well done. In the end, though, it can’t overcome the fact that it’s just half of a story that would have been enough for one more but is barely enough for two. But hey, if Harry Potter and the Deathly Hallows, Part 2 taught us anything, leaving all the best scenes for Mockingjay, Part 2 should make for one hell of a climax next year.